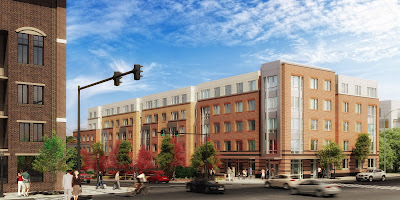 An AHC Inc.-developed affordable housing complex at the corner of East Reed Avenue and Route 1/Jefferson Davis Highway, in Alexandria, is now slated for an early 2014 groundbreaking, after hitting delays earlier this year. 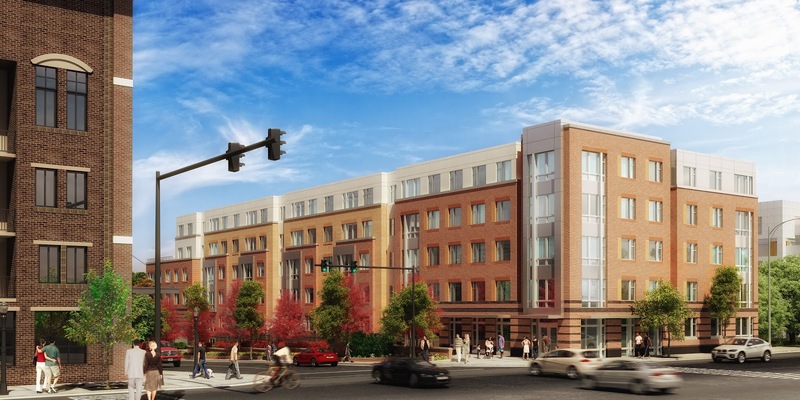 The latest iteration of the project, which has increased to 77 units, from an original 59, should head to the Alexandria City Council in December for final approval, according to John Welsh, Vice President at AHC. "We're really happy with the design," says Welsh. "The city planning office gave their opinion on it, and asked for a few minor changes. Mostly design stuff - switching a metal accent to the other side of the building so it would be a stronger element on Route 1, that kind of thing." The Bonstra-Haresign-designed building will offer 15 one-bedroom units, 51 two-bedroom units, and eleven three-bedroom units, at 60% of AMI (approximately $56,000/year). The facade is "primarily brick, with a few other materials, and some metal accents to give it a nice polish," said Welsh. The building will be five stories tall on the east side, and taper down to three stories on the west, and there will also be 77 below-grade parking spaces, a one-to-one ratio that marks a significant increase from the earlier design's 0.77 ratio, a number that caused some consternation among city planners as potentially insufficient. Construction is projected to take 18 months, with leasing estimated to take until the end of 2015. The project will sit on a joined plot consisting of a city-owned parcel at 3600 Jefferson Davis Highway and three privately-owned parcels controlled by AHC. Funding is being provided by a package of AHC funds, a $1.1 million-plus affordable housing loan from the city, and tax credits, the application deadline for the latter contributing, at least in part, to past delays. If they don't make the right lane on route 1 south continue to Reed Ave as a right turn only lane I will go insane. During bad traffic periods this stupid lane ending just before a useful street to turn off on is frustrating beyond words. @Anonymous AMEN. I have to give full recognition to a truly useful comment around here. Arlington's "Not So Big House"
West End Development Raising Tensions. Again.